Sunday's Xbox E3 Briefing was the largest in Microsoft Corp.'s history with more than 6,000 people, including more than 1,000 fans, invited to attend in the Microsoft Theater. Microsoft announced it is doubling its game development studios and showcased a record 52 games on stage including 18 console launch exclusives and 15 world premieres. The diverse lineup included games for every type of player, from exclusives like "Forza Horizon 4," "Halo Infinite" and "Gears 5," and independent titles like "Session," "Below," "Ashen" and "Tunic" to some of the biggest blockbuster games coming in the next year like "Fallout 76," "Tom Clancy's The Division 2," "Kingdom Hearts 3," "Devil May Cry 5," "Battlefield V," "Metro Exodus" and "Shadow of the Tomb Raider," many enhanced to take advantage of the power of Xbox One X. "There has never been a more exciting time to be part of the gaming industry, with creators large and small showcasing incredible new games for the more than two billion players around the world," Phil Spencer, head of Gaming at Microsoft, said. "At Microsoft, we are committed to empowering gamers to play the games they want, with the people they want, where they want." INVESTING IN DEVELOPMENT OF ORIGINAL CONTENTMicrosoft announced it is doubling its game development studios by adding five new creative teams to the Microsoft Studios family. Playground Games. Microsoft has acquired U.K.-based Playground Games, a development partner since 2010 that has helped grow the "Forza" franchise to new heights. In addition to its work on this year's "Forza Horizon 4," Playground Games will have a team dedicated to bringing their open-world expertise to an entirely new project. Ninja Theory. The relationship between Ninja Theory and Microsoft started in 2000 when "Kung Fu Chaos" was in development for the original Xbox and culminated in the release of "Hellblade" on Xbox One earlier this year. Microsoft's intent to acquire Ninja Theory will help ensure the creative team has the resources and freedom to bring more ambitious games like "Hellblade: Senua's Sacrifice" to fans. Undead Labs. Seattle-based Undead Labs is the creator of the popular "State of Decay" franchise, enjoyed by millions of fans worldwide. In the first two weeks since "State of Decay 2" launched, more than two million fans joined the fight to survive and took down more than two billion zombies. By entering into a letter of intent to acquire Undead Labs, Microsoft is signaling its commitment to growing the franchise and taking the zombie survival-fantasy genre to new heights. Compulsion Games. As "We Happy Few" nears its full, multiplatform release on Aug. 10, Microsoft has entered into a letter of intent to acquire Montreal-based Compulsion Games. By joining the team at Microsoft Studios, Compulsion will have the resources, platform and freedom to take even bigger creative risks and create even more ambitious worlds with its future projects. "The original games we create at Microsoft Studios are some of our biggest assets," Matt Booty, corporate vice president of Microsoft Studios, said. "Our growth strategy is to continue to expand the worlds that players love, while developing all-new exclusive games that deepen their engagement with our platform. We are thrilled to welcome five new studios into the Microsoft family. We believe these teams have the collective creative power and operational excellence to deliver the next industry game changers." The addition of these creative teams reinforces Microsoft's vision for gaming, which starts with a deep commitment to original content. The company is developing a portfolio of games on every device, including newly announced Microsoft Studios games. Revealed on stage today were three new Gears of War titles — "Gears 5," "Gears Tactics," "Gears Pop!" — along with "Battletoads," "Forza Horizon 4" and "Halo Infinite," a Master Chief story and the next major release in the franchise built from the ground up on the new Slipspace engine. ACCESS TO YOUR FAVORITE GAMES FASTER AND BETTER THAN EVERMicrosoft announced several new titles joining the Xbox Game Pass catalog this year including "Forza Horizon 4," "Fallout 4," "Tom Clancy's The Division" and "The Elder Scrolls Online: Tamriel Unlimited," as well as several new ID@Xbox games being added on their release date. Microsoft also introduced new innovations to push digital gaming forward, including FastStart, an innovation from Microsoft's Machine Learning Team, and plans from Microsoft's Gaming Cloud Team to develop a game streaming service to unlock console-quality gaming on any device. "We've been thrilled to see the positive impact Xbox Game Pass is having on the gaming ecosystem, including increasing the number of titles gamers play nearly 40 percent and increasing gameplay hours by almost 20 percent," Mike Nichols, chief marketing officer for Gaming at Microsoft, said. "With the ultimate freedom to explore and play over 100 great games, Xbox Game Pass delivers our members an incredible value in gaming." Xbox Game Pass. The Xbox Game Pass catalog continues to expand, with exciting new blockbuster titles available to members starting today, including "Fallout 4," "The Elder Scrolls Online: Tamriel Unlimited" and "Tom Clancy's The Division." Microsoft also announced several notable titles launching through the ID@Xbox program that will be coming to Xbox Game Pass this year to coincide with their debut on Xbox One. These include "Warhammer: Vermintide 2," "Ashen," "Afterparty" and "Phoenix Point," as well as blockbusters from some of our biggest first-party franchises such as "Forza Horizon 4," "Crackdown 3," "Gears 5" and "Halo: The Master Chief Collection," which will release later in 2018 and beyond. FastStart (Xbox One). With FastStart, you can now jump into your gamei twice as fast and play after downloading just a fraction of your title. FastStart identifies which files are needed to begin playing and prioritizes the download of those files first, enabling you to quickly jump into full-fidelity gameplay while the remainder of your title downloads in the background. Simply find the FastStart-enabled title you want to play, hit Download and your console will take care of the rest. It's that simple. BEST PLACE TO PLAY ORIGINAL, BLOCKBUSTER AND INDEPENDENT GAMESXbox One continues to be the best place to play the biggest blockbuster games with over 220 titles enhanced for Xbox One X, the world's most powerful console, with new games leveraging the power of the platform from some of the world's most talented creators like "Fallout 76" from Bethesda Game Studios, "Cyberpunk 2077" from CD Projekt Red, "Tom Clancy's The Division 2" from Ubisoft Massive and dozens more. Independent game creators also continue to innovate on Xbox One with games like "Session," "Below," "Ashen" and "Tunic" coming to Xbox One as console launch exclusives. "BATTLEFIELD V" (ELECTRONIC ARTS). Available worldwide Oct. 19, 2018, enter mankind's greatest conflict with "Battlefield™ V" as the series goes back to its roots in a never-before-seen portrayal of World War 2. Take on all-out multiplayer across the world or witness human drama set against global combat in single player War Stories, including Nordlys — a first look shown in the Xbox E3 briefing — the story of a young Norwegian resistance fighter during the German occupation, you must pay an unthinkable price to save not only yourself, but also your family. "CRACKDOWN 3" (XBOX ONE AND WINDOWS 10 EXCLUSIVE). "Crackdown 3" brings the boom next February, where players will stop crime as a super-powered Agent in a sandbox of mayhem and destruction. Developed by Microsoft Studios in collaboration with Sumo Digital and Elbow Rocket, "Crackdown 3" delivers cooperative mayhem, signature antics, explosive gameplay and an all-new multiplayer mode,ii Wrecking Zone, where destruction is your ultimate weapon powered by Microsoft Cloud. Available worldwide in February 2019. "CUPHEAD: THE DELICIOUS LAST COURSE" (STUDIO MDHR). In "Cuphead: The Delicious Last Course," Cuphead and Mugman are joined by Ms. Chalice for a DLC add-on adventure on a brand-new island! With new weapons, new charms and Ms. Chalice's brand new abilities, take on a new cast of multifaceted, screen-filling bosses to assist Chef Saltbaker in Cuphead's final challenging quest. "CYBERPUNK 2077" (CD PROJEKT RED). "Cyberpunk 2077" is a narrative-driven, open world RPG set in the most vibrant and dangerous metropolis of the future — Night City. You play as V, a hired gun on the rise, who just got their first serious contract. In a world of cyber-enhanced street warriors, tech-savvy netrunners and corporate lifehackers, today is your first step to becoming an urban legend. "DEVIL MAY CRY 5" (CAPCOM). A brand-new entry in the legendary over-the-top action series comes to Xbox One in spring 2019, complete with its signature blend of high-octane stylized action and otherworldly and original characters the series is known for. Years have passed since the legions of hell have set foot in this world, but now a new demonic invasion has begun, and humanity's last hope will rest in the hands of three lone demon hunters, each offering a radically different play style. United by fate and a thirst for vengeance, these demon hunters will have to face their demons if they hope to survive. The devil you know returns in the most over the top, technically advanced, utterly insane action experience of this generation. "DYING LIGHT 2" (TECHLAND). The bold sequel to the open-world phenomenon, "Dying Light 2" brings to life a unique post-apocalyptic vision of the Modern Dark Ages, where your parkour abilities and brutal combat skills are the only things that let you dive into darkness and emerge alive. Make morally grey decisions, shape the transformation of the City and ultimately decide its fate. "FALLOUT 76" (BETHESDA GAME STUDIOS). The award-winning creators of "Skyrim" and "Fallout 4" welcome you to "Fallout 76" — a stunning prequel and the largest world ever created in the legendary Fallout universe. Set in the hills of West Virginia, you are one of the first to emerge, into a new and untamed wasteland. "FORZA HORIZON 4" (XBOX ONE AND WINDOWS 10 EXCLUSIVE – WORLD PREMIERE). In "Forza Horizon 4," seasons change everything. This highly anticipated follow-up to 2016's breakout hit "Forza Horizon 3" brings players dynamic seasons in a shared open world that change every week. Experience beautiful, historic Britain in spectacular native 4K and HDR, collect over 450 cars, and become a Horizon Superstar. "Forza Horizon 4" will launch worldwide on Xbox One, Windows 10 and Xbox Game Pass on Oct. 2, 2018, as an Xbox Play Anywhere title. "GEARS 5" (XBOX ONE AND WINDOWS 10 EXCLUSIVE – WORLD PREMIERE). As Kait, journey across the biggest, most beautiful Gears world ever created. Play solo or with a friend in local split-screen co-op, or online co-opiii and experience every mode in 4K Ultra HD resolution with stunning HDR at a smooth 60 frames per second. "Gears 5" will be released in 2019 on Xbox One and Windows 10 and will come to Xbox Game Pass on the same date as its global release. "GEARS POP!" (IOS AND ANDROID EXCLUSIVE – WORLD PREMIERE). "Gears Pop!" brings together iconic Gears characters in a cute Funko Pop! style. The game is being developed in partnership with Funko (Nasdaq "FNKO") and inspired by the "Gears of War" vinyl collectible figures. It's the perfect slice of mobile mayhem, available on iOS and Android in 2019. "GEARS TACTICS" (WINDOWS 10 EXCLUSIVE – WORLD PREMIERE). "Gears Tactics" evolves turn-based tactics games combining signature fast-paced brutal action and character-driven storytelling with customizable squads, upgradable weapons, and, of course, massive boss battles. "Gears Tactics" is also the first Gears game to be specifically designed for PC gamers. "HALO INFINITE" (XBOX ONE AND WINDOWS 10 EXCLUSIVE – WORLD PREMIERE). The Master Chief returns in the next chapter of the legendary franchise in "Halo Infinite." Developed by 343 Industries and created with the studio's new Slipspace Engine, "Halo Infinite" debuted at the Xbox E3 2018 Briefing with a thrilling engine demo that provides a glimpse into the future of Halo, leading the franchise into new and unexpected directions. "JUMP FORCE" (BANDAI NAMCO ENTERTAINMENT AMERICA INC). The greatest heroes and villains from the 50-year history of Shueisha's influential Japanese Weekly Jump manga will battle against each other across iconic locations across Earth in this anime fan's dream come true! Featuring the world's most popular and classic manga and anime franchises including DRAGON BALL Z, ONE PIECE, NARUTO, and many others, players will be able to compete in hyper-stylish arena brawls set against familiar backdrops of famous landmarks around the world, including New York City's Times Square and the Matterhorn. "JUST CAUSE 4" (SQUARE ENIX). Rogue agent Rico Rodriguez journeys to Solis, a huge South American world home of conflict, oppression and extreme weather conditions. Strap into your wingsuit, equip your fully customizable grappling hook, and get ready to bring the thunder! "KINGDOM HEARTS III" (SQUARE ENIX). "KINGDOM HEARTS III" tells the story of the power of friendship as Sora and his friends embark on a perilous adventure and support each other through difficult times. Set in a vast array of Disney worlds, "KINGDOM HEARTS" follows the journey of Sora, a young boy and unknowing heir to a spectacular power. Sora is joined by Donald and Goofy to stop an evil force known as the Heartless from invading and overtaking the universe. Through the power of positivity and friendship, Sora, Donald and Goofy unite with iconic Disney-Pixar characters old and new to overcome tremendous challenges and persevere against the darkness threatening their worlds. "METRO EXODUS" (DEEP SILVER). "Metro Exodus" is an epic, story-driven first person shooter from 4A Games that blends deadly combat and stealth with exploration and survival horror in one of the most immersive game worlds ever created. Explore the Russian wilderness across vast, nonlinear levels and follow a thrilling storyline that spans an entire year through spring, summer and autumn to the depths of nuclear winter. Inspired by the novels of Dmitry Glukhovsky, "Metro Exodus" continues Artyom's story in the greatest Metro adventure yet. "NIER: AUTOMATA" BECOME AS GODS EDITION (SQUARE ENIX). "NieR: Automata" is a revolutionary action RPG set in a post-apocalyptic world overrun by machine lifeforms and abandoned by mankind. As part of an android army created by humans to reclaim the planet, players will fight their way through the mechanical horde using a collective of close-combat weapons and ranged attacks. "ORI AND THE WILL OF THE WISPS" (XBOX ONE AND WINDOWS 10 EXCLUSIVE). The highly anticipated sequel "Ori and the Will of the Wisps" made its worldwide gameplay debut, showcasing Ori's immersive world, dynamic combat mechanics, gripping enemy encounters and challenging puzzles in this story-driven adventure. "Ori and the Will of the Wisps" releases on Xbox One and Windows 10 in 2019. "PLAYERUNKNOWN'S BATTLEGROUNDS" (CONSOLE LAUNCH EXCLUSIVE).PLAYERUNKNOWN'S BATTLEGROUNDS (PUBG), the tactical, high-octane battle royale phenomenon, debuted footage from two new maps: Sanhok, a smaller-scale, action-packed map inspired by the islands that dot the Southeast Pacific Ocean, and a snow-covered map currently in development. New footage also debuted of War Mode, a deathmatch-style battle royale gaming experience and the world premiere debut of the Ballistic Shield, a new tool for setting up quick cover for explosive and close-distance attacks. Sanhok and War Mode will debut on Xbox in late summer 2018. "SEA OF THIEVES" (XBOX ONEiv AND WINDOWS 10 EXCLUSIVE). "Sea of Thieves," the shared-world multiplayer game that provides the quintessential pirate experience, returns with additional content that continues to grow and evolve the game. Releasing in July, Cursed Sails will bring a new threat to the seas in the form of terrifying skeleton ships. In September, Forsaken Shores will reveal a perilous new part of the world, filled with dangers that will test the skill and nerve of even the most hardened crews. Each update will be accompanied by a time-limited campaign that introduces content in a fun, engaging and memorable way. "Sea of Thieves" is now available on Xbox One, Windows 10 and Xbox Game Pass as an Xbox Play Anywhere title. "SEKIRO™: SHADOWS DIE TWICE" (ACTIVISION). A fantastical, dark and twisted new gameplay experience developed by the renowned team at FromSoftware and published by Activision. Directed by Hidetaka Miyazaki, "Sekiro: Shadows Die Twice" is a third-person, action-adventure game with RPG elements. The single-player game puts gamers in the protagonist role of a hard-hearted warrior whose mission is to rescue his master, a young lord, and exact revenge on his arch nemesis. "Sekiro: Shadows Die Twice" is scheduled for release in early 2019 for the family of Xbox One devices from Microsoft, including the Xbox One X. Preorders are available now at select retailers for the suggested retail price of $59.99. "SESSION" (CREA-TURE STUDIOS). Inspired by the golden era of skateboarding, the early 90s and early 2000, "Session's" primary goal is to make you experience what skateboarding really is: an incredible sport where there are no other goals other than expressing your creativity and achieving success through hard work, perseverance and bits of madness for no one else other than yourself. "SHADOW OF THE TOMB RAIDER" (SQUARE ENIX). Experience Lara Croft's defining moment as she becomes the Tomb Raider. In "Shadow of the Tomb Raider," Lara must master a deadly jungle, overcome terrifying tombs, and persevere through her darkest hour. As she races to save the world from a Maya apocalypse, Lara will ultimately be forged into the Tomb Raider she is destined to be. "TALES OF VESPERIA: DEFINITIVE EDITION" (BANDAI NAMCO ENTERTAINMENT AMERICA INC).Available this winter, "Tales of Vesperia: Definitive Edition" celebrates the 10th anniversary of this cherished RPG with new fully playable characters, events and other additional content never released outside of Japan. Follow Yuri Lowell, a former Imperial Knight, as he befriends a colorful cast of characters throughout the world of Terca Lumireis and finds himself in the middle of a nefarious plot that threatens the destruction of the entire planet. "THE AWESOME ADVENTURES OF CAPTAIN SPIRIT" (SQUARE ENIX). Have you ever dreamt of being a superhero? Meet Chris, a creative and imaginative 10-year-old boy who escapes reality with fantastical adventures as his alter ego, the Awesome Captain Spirit! Return to your childhood and play a touching and heart-warming one-of-a-kind narrative experience from the directors and development team behind the BAFTA award-winning game "Life is Strange." "The Awesome Adventures of Captain Spirit" is an original story set in the Life is Strange Universe that contains links to the brand new story an characters of "Life is Strange 2." "TOM CLANCY'S THE DIVISION 2" (UBISOFT). Developed by Ubisoft Massive and the same teams that brought you "Tom Clancy's The Division®," "Tom Clancy's The Division® 2" is an online open-world, action-shooter RPG experience set in a collapsing and fractured Washington, D.C. This rich new setting combines a wide variety of beautiful, iconic and realistic environments where the player will experience the series' trademark for authenticity in world- building, rich RPG systems, and fast-paced action like never before. Play solo or co-op with a team of up to four players to complete a wide range of activities, from the main campaign and adversarial PvP matches to the Dark Zone — where anything can happen. "TUNIC" (FINJI). "TUNIC" is an isometric action adventure about a tiny fox in a big world. Embark on an adventuresome questabout set in that place just beyond the farthest you've ever been! Explore ancient ruins, fight monsters and uncover mysterious secrets. The world is big and scary — so be brave, little one! "WE HAPPY FEW" (COMPULSION GAMES, GEARBOX PUBLISHING). After debuting as an Xbox Game Preview title at the 2016 Xbox E3 Briefing, "We Happy Few" 1.0, which includes an all-new narrative and community-driven improvements, will launch on Xbox One and Xbox One X (with 4K and HDR support) on Aug. 10, 2018. "We Happy Few" is a narrative-driven action adventure game set in a drug-fueled, retrofuturistic 1960s England. Uncover the mystery of Wellington Wells as you play through the interwoven narratives of three moderately terrible citizens trying to escape from a lifetime of cheerful denial. BIGGEST XBOX SALE OF THE YEAR HAPPENING NOWMicrosoft also announced its Biggest Xbox Sale of the Year where gamers can find discounts on hundreds of games, accessories, Xbox Game Pass and Live Gold subscriptions, plus $50 off ANY Xbox One. For more information, visit Xbox Wire. Be sure to preorder now at your Microsoft Store or local retailer. 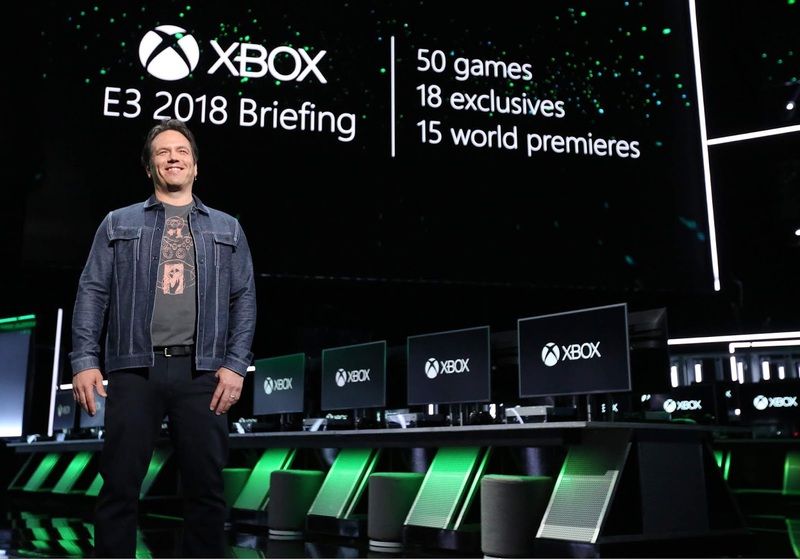 With retail locations across the U.S., Canada, Puerto Rico and Australia, and through Microsoft.com, fans can begin preordering their favorite games and select accessories and hardware from this year's Xbox E3 2018 Briefing right now. For a list of Microsoft Store locations, visit microsoft.com/en-us/store/locations/find-a-store. WATCH E3 LIVE STREAMING ON MIXERFor additional news, highlights, exclusive reveals and a behind-the-scenes look at some of your favorite games throughout the week of E3, watch Inside Xbox: Live @ E3 on June 11 at 3 p.m. PDT and tune in to live streaming on Mixer June 12 and June 13.